While technically this is not a tourist attraction, there is nothing to stop you from wandering around the campus grounds of this small university in Old Town. You probably won’t be able to get access into the buildings of the schools unless accompanied by a student or if you have an appointment. But there are a few highlights worth checking out. Inside the arcaded university square you’ll find a pretty little courtyard. In the center of the courtyard you’ll find the bust of Gabriel Garcia Marquez. This is also the location where that Nobel-prize winning novelist’s ashes are buried. If you’re lucky you might get to see students performing music or street theatre. 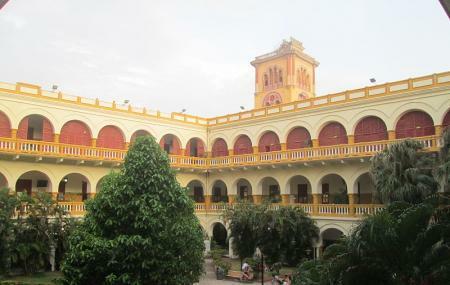 Cartagena is a wonderful city. Hope for the best to this young generation. Universidad de cartagena, histórico edificio, las facultades de ciencias humanas y comunicación social se encuentran aquí, el paraninfo esta acústicamente diseñado. El ascensor es insuficiente o no sirve.